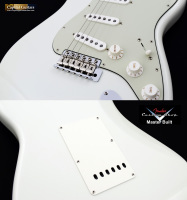 If you are looking for one of the finest Stratocasters that the Fender Custom Shop has to offer, this guitar deserves your consideration. 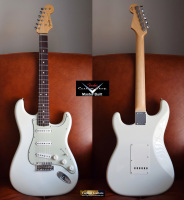 Offered is this Masterbuilt '59 NOS Stratocaster by Greg Fessler. As a Masterbuilt instrument, it should be no surprise that the attention to detail is incredible. 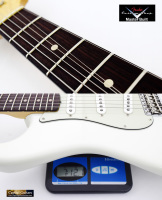 The specifications for this masterpiece include: a two piece Alder body with an Olympic White nitrocellulose lacquer finish and a total guitar weight of just light weight of just 7.75 pounds; a large C-shaped quartersawn Maple neck with depth measurements of .875" at the first fret and .950" at the twelfth fret; a nice dark Rosewood fretboard with 9.5" radius, medium/jumbo fret wire and a 1.650" bone nut; and for electronics, 69 Stratocaster single coils in the neck and middle positions and a Texas Special single coil in the bridge position with VTT and five-way switching. The middle pickup is reverse wound/reverse polarity for additional quack. 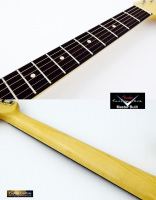 This guitar is an understated masterpiece with it's flawless NOS finish. 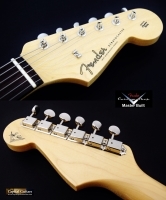 It plays and sounds like the best Fender has to offer. 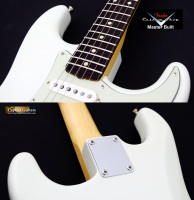 It nearly plays itself it is setup so well and the tone is just what you are looking for in a high end Stratocaster. Check out the brief sound sample provided; this thing sounds fabulous! This beautiful guitar is in mint/near mint condition, with no flaws of any significance and the frets show no observable wear. It could easily pass for a new instrument. It comes in it's original brown G&G case, along with the certificate of authenticity and the accessories shown. I should note that the right case latch sticks a bit, but is fully functional. 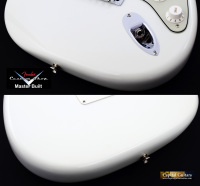 New Masterbuilt Strats run nearly $7K new these days. Get this near mint 2014 Greg Fessler beauty for substantially less. 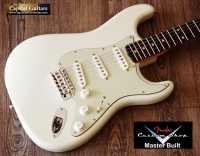 One sweet Strat here - make it yours!